With numerous years of experience, James Flinn handles all types of personal injury matters, including car accidents, truck accidents, medical malpractice, products liability, and more. He has served over one hundred clients across the state of Louisiana and is proud to continue to serve New Orleans residents. James practices exclusively in personal injury and property damage litigation. He is licensed to practice in all state courts in Louisiana, as well as all Louisiana federal courts. This includes the Eastern District, Western District, Middle District, and 5th Circuit Court of Appeals. He is an active member of both the Louisiana State Bar Association and the Louisiana Association for Justice. 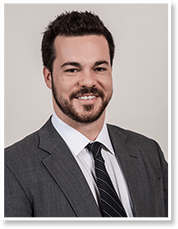 James graduated with honors from Tulane University Law School where he excelled in personal injury, insurance law and litigation based courses, earning the top grade in his class in Civil Litigation Skills and Strategy. He is extremely knowledgeable in all aspects of personal injury law and will do everything in his power to defend his clients. Contact our attorney today if you would like to talk about your case.